Wedding season is approaching and all the brides to be are busy deciding on their attire and jewellery. However, a bridal look remains incomplete without mehendi. Brides nowadays want designs that have a modern touch to it, and Arabic mehendi will be ideal for them. 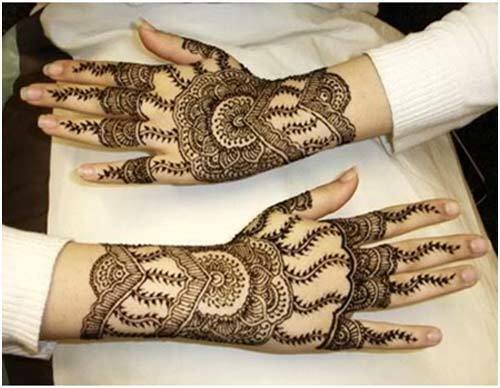 In Arabic Mehendi the designs have distinctive floral art work and a free flowing structure; the floral designs are repeated in a geometric pattern covering entire hands and foot. 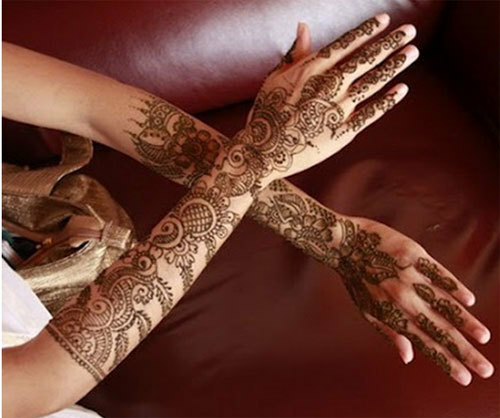 Arabic mehendi will accentuate the beauty of the bride and make her look ravishing! As the name suggests Arabic Mehendi originated in Arabian countries and it gradually gained popularity in Asia, especially in India and Pakistan. 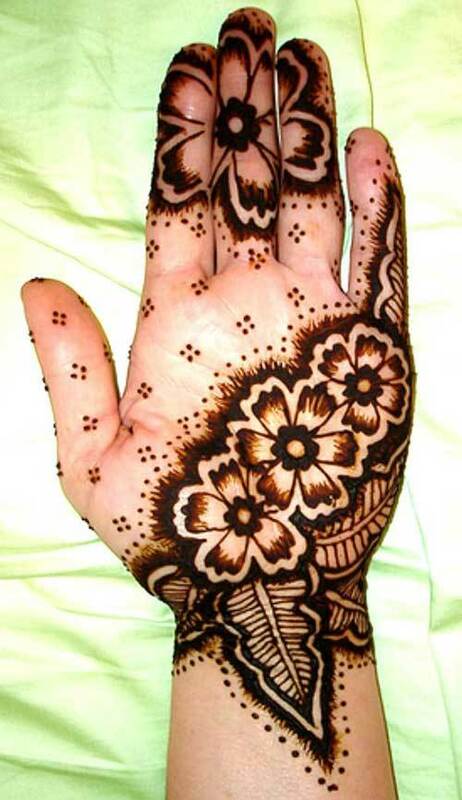 Often Indian motifs are combined along with Arabic mehendi, resulting in mixed patterns. 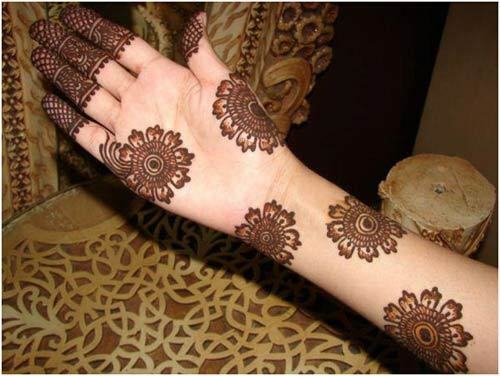 Arabic mehendi is more bold and prominent because it is created using dark brown and black mehendi instead of red mehendi. 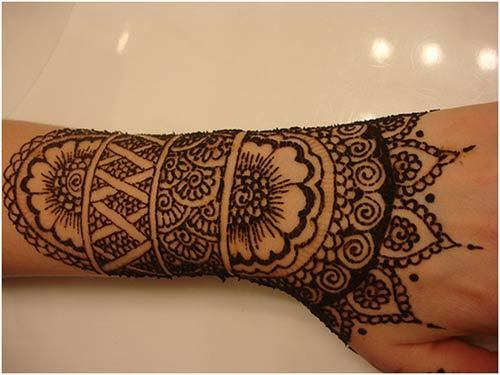 The outline or borders of the designs are created using black mehendi that makes it look bold and beautiful. 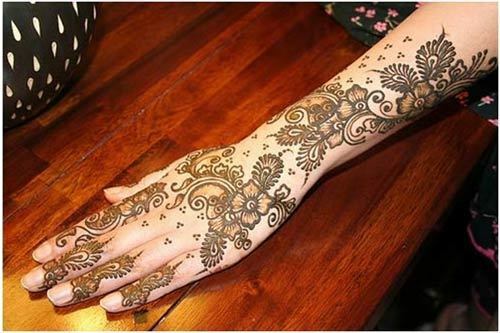 It is easier to create Arabic mehendi design and it is suitable for any occasion. Even if you are not an expert at creating mehendi, you can still create your own mehendi at home or try it on your friends. Here are some simple Arabic mehndi designs for hands and feet that is beautiful and can be easily created at home anytime. 1. This design is simple, elegant and not messy. 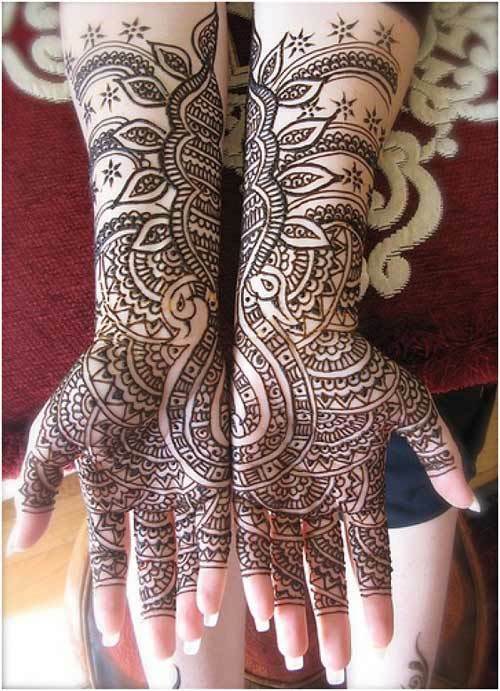 Those who shy away from full hand designs can try this mehendi design. The motifs are not complicated and the floral patterns are very feminine. This design is suitable for any occasion and can be done by anyone. Even if you are not an expert at creating mehendis you can still make this design. 2. 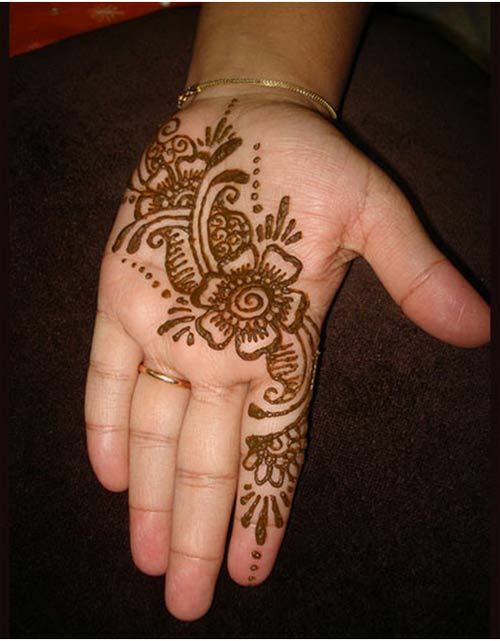 This mehendi design will look very beautiful on top or back of your hands. This design covers the top of the hands, fingers and the wrist. The design is a combination of paisley and floral motifs and on the wrist there is a bangle like design which makes it unique.This mehendi design is neither too full nor too less. Yet, this designmakes the hands look filled up and beautiful without having too much detail and intricate designs. This is aneasy and perfect way to decorate the top or back of the hands for your wedding or for any other occasion. 3. 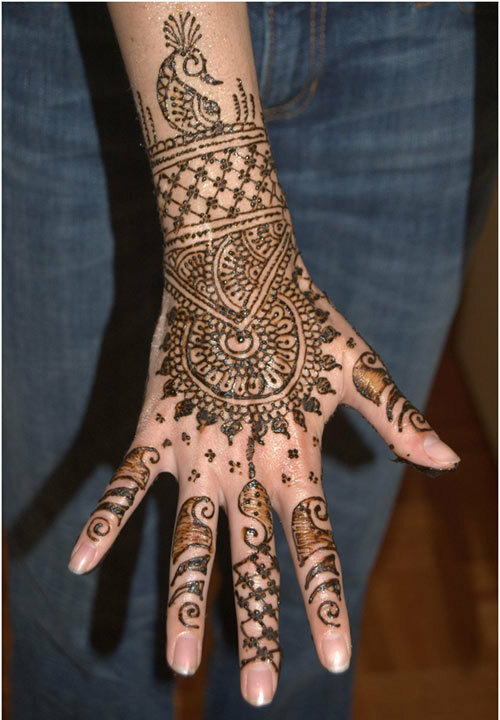 Want to try some out of the box Arabic mehendi design for your hands? Then you can definitely try this one. The inverted heart pattern and the net like patterns with tiny flowers make this mehendi design very different from the usual ones. This Arabic mehendi design is very intricate due to the minute details, may be a little complicated to create. However, this design will look stunning on the hands of the bride. 4. Another simple yet beautiful design for the back or top of the hands. This design is a combination of flowerand an arch like motif makes it ideal for Eid and weddings. Eid calls for a great feast and celebration, and how can a celebration be complete without mehendi! 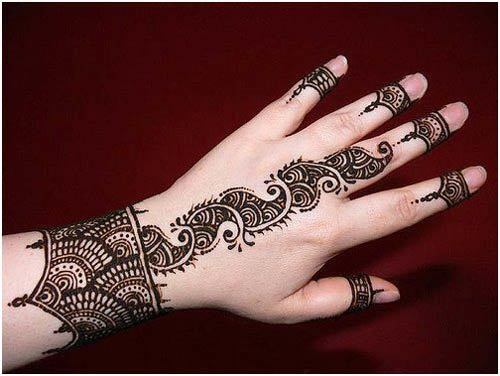 Moreover, Arabic Mehendi design is a reflection of Islamic religion and culture, so this pretty and simple design is suitable for Eid and other similar celebrations in the Muslim community. 5. This Arabic mehendi design for the wrist is quite unique. You may use this design by itself keeping the palm free of any colour or you can also include it into any other design you like.You can even use this design as a mehendi tattoo. It is the simplicity of the design that gives it a modern look, it will be a great hit among teenagers and college goers. 6. Looking for some unique and creative Arabic mehendi designs for hands? 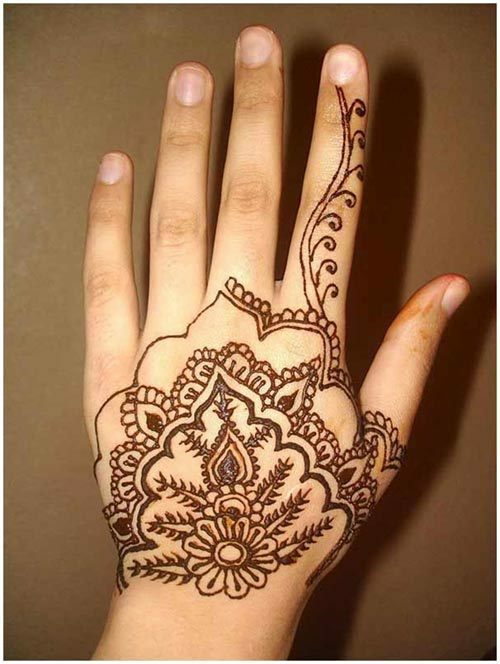 This mehendi design isdifferent with the large floral pattern on the three fingers. While on one side of the palm and fingers are decorated with intricate large designs the other side is kept simple with occasional dots. It is a nice blend of intricate as well as simple motifs making this design an ideal choice for the modern bride and it can also be tried on anyone who wants their hands to do all the talking. This design will surely let your hands stand out from the crowd! 7. A great look for parties! This mehendi design is one of the latest Arabic mehendi designs. This design comprises of three elements, a bracelet like design on the wrist, the intricate paisley design on the back of the hands and ring like design on the fingers. 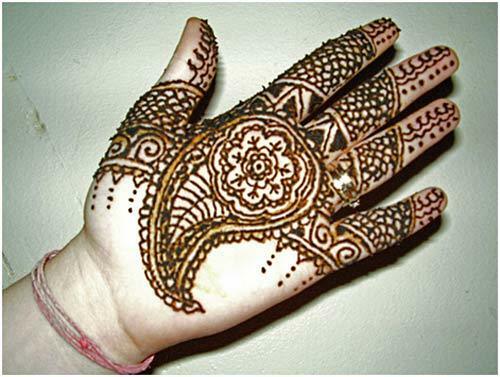 The design on the wrist is very intricate and has semi-circular and floral motifs. This design resembles Indian bridal jewellery usually worn on the hands, if you decide to wear this mehendi design for a party then you don’t even need to wear any other accessories on the hand. Keep your look simple so the focus remains on your well decorated hands. 8. This mehendi design is another unique option for the top or back of your hands. It is an intricate design with minute details. 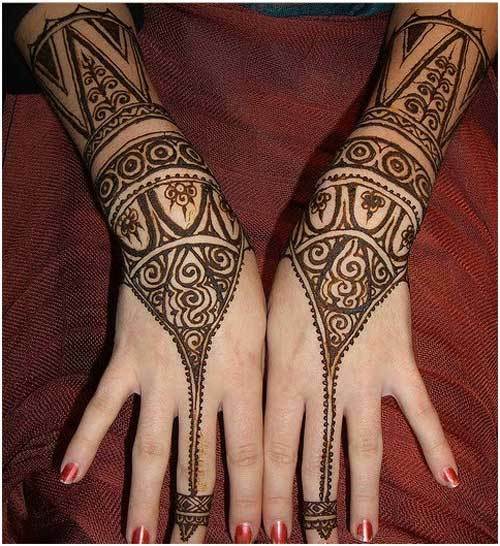 The use of black mehendi and very thin lines make this mehendi design look even more beautiful. This mehendi design comprises of distinctive and different patterns, it has floral motifs, geometrical patterns and other shapes inspired by Islamic culture. This design fills up the hand and it is sure to capture instant attention. 9. Those who want very intricate designs that fill the hands, yet which are simple mehendi designs, this will be a great choice. 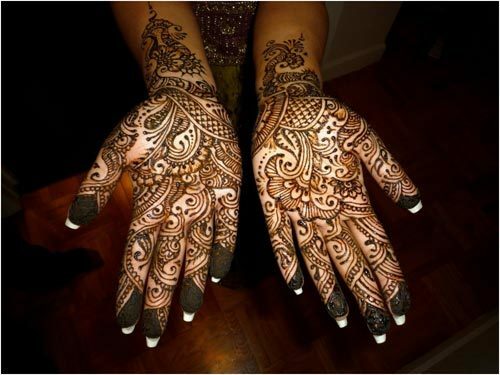 This mehendi design uses large motifs to cover a large part of the palm making the design look filling. The designs are mainly floral with tiny dots in the gaps. The design covers the fingers, top of the hand and the entire wrist. This beautiful design will make everyone stop and stare at your hands. 10. If you love different and unique patterns, then you can try this one. It is a lovely blend of intricate small mehendi patterns and open spaces making it apt for the modern bride or for any other occasion.The gap or open spaces are left purposely in this design to make it look very different. The thumb and the space below it has designs and the same intricate pattern is repeated in the fingers and it also covers a little space below the fingers, tiny heart shapes cover the gap between these two designed portions. The outline of the design is darkened to create the bold impact. The tips are kept open rather than being covered in mehendi. Shading makes this design stand out. This design is sure to turn heads! 11. For those looking for a different design for Eid and other occasions this one will be a good choice, since it has a great mix of patterns and shading. The fingers are also decorated with mehendi and the middle finger is given special importance with multiple patterns and lace like design. The circular design on the top of the hand, the lace design on the wrist and the shading done on the fingers makes the design very unique. 12. 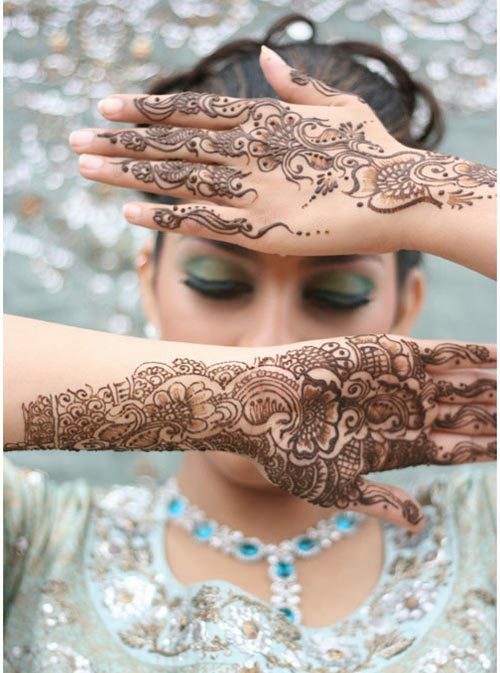 This mehendi design is an example of the bridal Arabic mehndi designs which is sure to take your breath away. This design is full of complex patterns and small details. The patterns are also quite unique and will make you the cynosure of attention in the party. The tips are kept open for that unique touch. 13. Here is a fairly simple design with large motifs. The three hibiscus flowers with minimal designs around it make it a great choice. This design is apt for Eid and even for the bride who wants something simple yet pretty for the feet. 14. Love intricate full hand designs? Then we have this style for you. 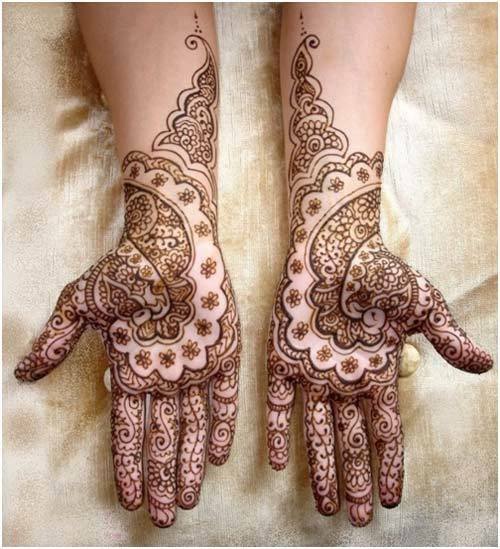 This style is great and it fills up the hands with intricate designs to make them look beautiful. 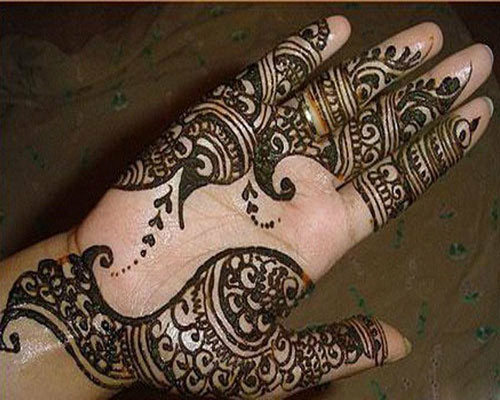 The tips are shaded with mehendi and this pattern fills up the entire hands, and the design extends beyond the wrist also making it a good choice for the bride. 15. This beautiful and intricate design is apt for the bride who likes small designs and motifs. It fills the hands and will surely draw everyone’s attention to your hands at the wedding. Different designs are used for the top or back of the hands and the palms. This design is a combination of many patterns. Thin lines and very fine designs are used in this design, making this mehendi design a super choice for the bride to be. 16. This design is apt for the bride’s feet. We all know that at any wedding, the bride is the center of attraction, so why leave your feet bare when you can use these pretty designs to fill them up and make them look beautiful. This design fills the feet completely and the small leaves pattern on the toes makes the entire design look more attractive. 17. Those who love simple patterns for their mehendi can choose this design. It has less number of designs and a large portion of the hand is kept empty. 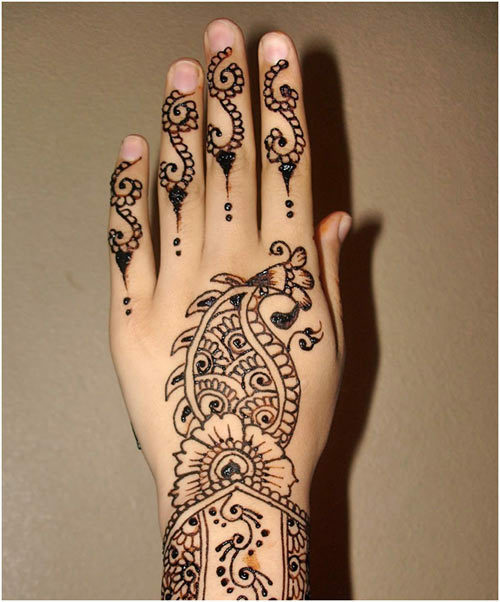 Though there are a number of intricate designs making it a beautiful mehendi choice for Eid. The design on the fingers and the large flower looks great and accentuates your well-manicured hands. 18. This design is really unique and apt for the modern bride. 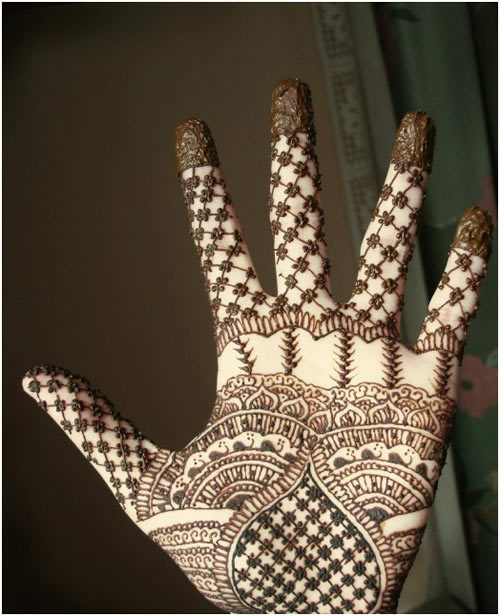 This is a great way to clad your hands with mehendi. This mehendi design will surely elicit the ‘wow’ response from all the guests. 19. Now for a much simpler yet filling design for the hands. This is really apt for the brides and the festive occasions too. This design has intricate motifs and the inverted paisley pattern makes it look pretty. 20. This design fills up the whole hands and makes them look beautiful. There is a good use of black mehendi and shadings too. The inclusion of the peacock is quite unique in an Arabic pattern as the peacock design is usually seen in traditional Indian mehendi designs. 21. 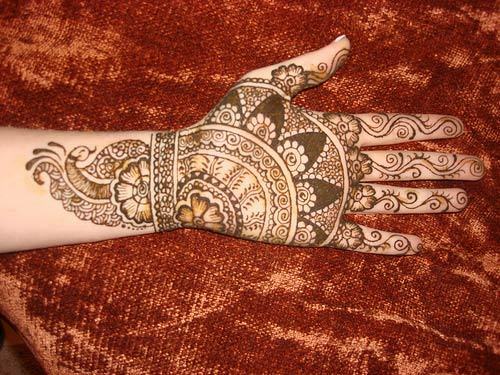 The mehendi design is a great choice for the bride. The floral designs fill up the hand and make them look pretty. The designs are mostly floral and have small dotted patterns over the hands too. The fingers are also decorated using small yet dainty patterns. 22. Do you love intricate designs on the feet? Would you want to get one done at your wedding? You can try this design as it full of delicate details and covers your entire feet. The diagonal lace patterns and floral designs make it stand out from other designs. 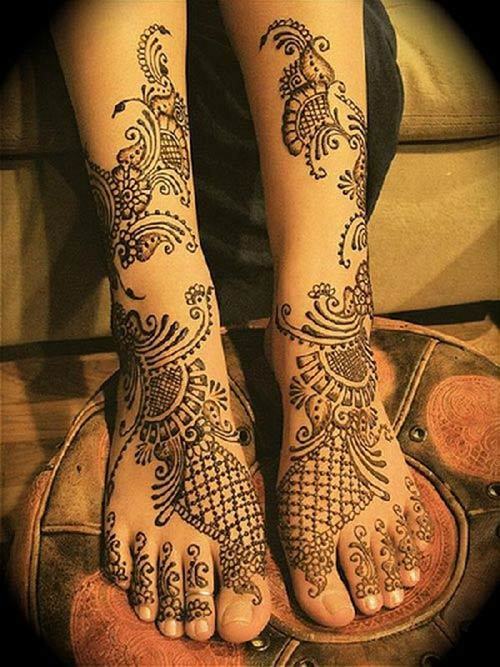 This mehendi style will surely attract a lot of attention to your feet at the weddings. 23. 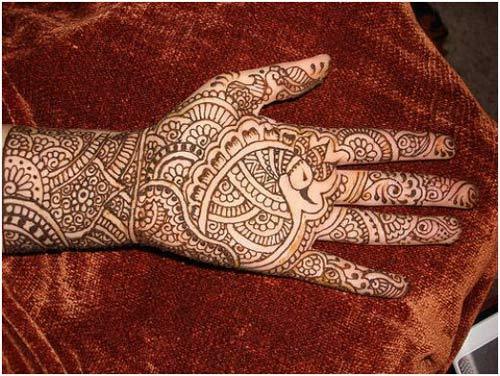 This intricate mehendi design is just meant for brides, while others can try it too! It is the minute details that make this design so magnificent.The designs are different on both hands, so you can choose any one of them or even try both of them just like it is given in the picture above. 24. The main feature of this design is the semi-circle patterns in the middle of the hands and the delicate details presented in the design. There are small and minute patterns and details which make this ideal for the bride. She will truly be the center of attraction with this design on her hands. 25. Here is a very girly floral and unique design. This out of the box design will attract attention to your hands. It has a touch of femininity with the large flowers on the hand and the open spaces create a special impact. The tips are specially emphasized using the intricately done patterns. This style is not messy and looks perfect on the hands of would be brides too. 26. 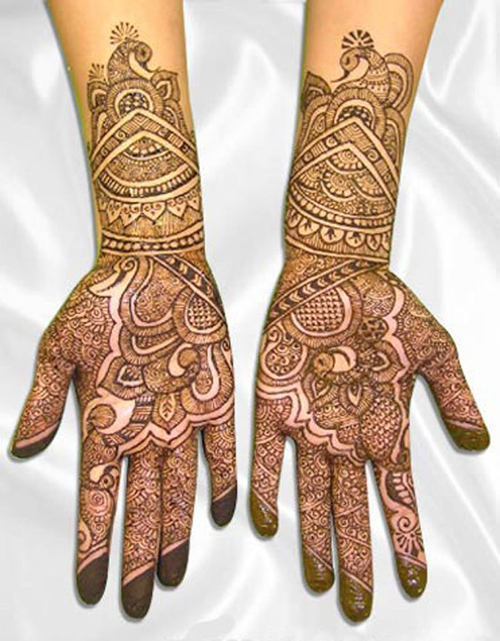 This mehendi design is perfect suitable for important occasions like festivals and will great on brides. The design has lots of detail and cover up the hands beautifully. There is a predominance of floral patterns in this design and the gaps left in the design make it different. The peacock motif adds to the beauty. 27. Here’s a great style for the occasion of Eid. The delicately done intricate motifs are very beautiful and the concentrated designs on the base of each finger make this mehendi design different. The combinationof different designs and the leaf patterns used in the palms and fingers are really gorgeous. The tips are kept open. This design will also be apt for the bride. 28. Do you love glitter? Do you like it if your mehendi clad hands could shine with golden shimmer of the glitter? If yes, then this one will be a suitable choice for you. The tube glitter is used to fill the designs and add to the glamour quotient. Colourful stones used along with the glitter make it a favourite design among the youngsters. It is a great choice for evening parties. 29. 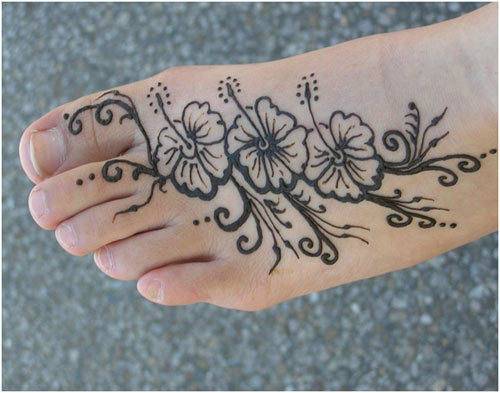 Here’s another intricate design for the feet that has very delicate details. This one is ideal for the bride’s feet and is sure to capture attention. This design has lots of small and fine details and intricately done designs to give it that rich feeling. The black mehendi and thin lines make it even more stunning. 30. This design has the bridal touch to it. It incorporates very delicate designs and minute art work to give it a unique touch. The Style is different because it is a mix of Indian as well as Arabic mehendi patterns and some gaps are also left in this design. This will be a great choice for the bride who is looking for some out of the ordinary designs for her wedding day. The finger tips are kept open for that added effect. These were some of the traditional and latest arabic mehndi designs. Though most of these mehndi arabic designs are meant for the bride it can also be done for festivals and other important social functions. At the beginning you will find it difficult to do the intricate designs at home, if you practice the small patterns on your hands occasionally, you will become a pro. 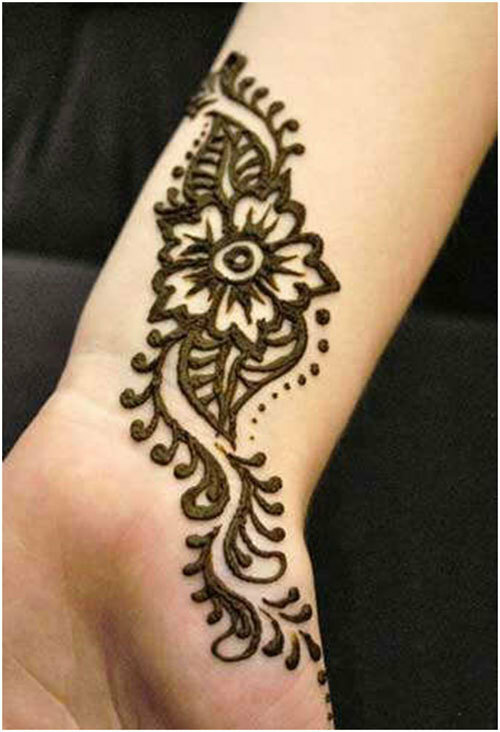 Always outline your designs with black mehendi and use very thin lines to do the designs to make the mehendi look neat and prominent. 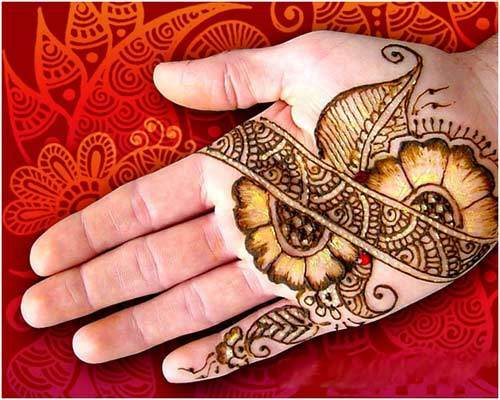 Just enjoy your mehendi session with friends and family, and don’t forget to flaunt your hands in the party!